Agravaine is the son of Lot and Morgause and the brother of Gawain. In the Vulgate Lancelot, Agravaine is said to be arrogant and jealous and ready to speak evil words. Although he shows no pity or love, he is a bold knight. In the Vulgate Mort Artu, he tells Arthur that Lancelot loves Guinevere and then traps the lovers in the queen’s room. He is killed by Lancelot in the rescue of the queen from the pyre. 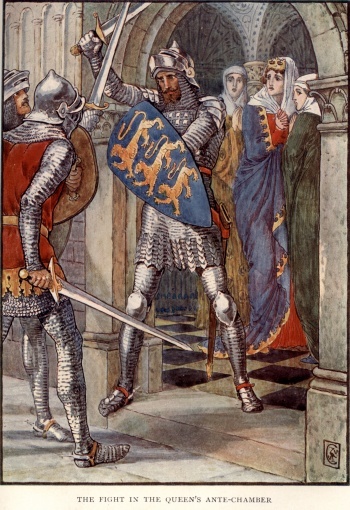 In Malory’s Morte d’Arthur, Agravayne plots with Mordred to trap Lancelot and Guinevere and is killed in the fight at the door of the queen’s chamber. The death of Agravayne does not cause Gawain to seek vengeance because he had warned his brother of the dangers of plotting against Lancelot. Gawain feels that Agravayne was responsible for his own death. In T. H. White’s Once and Future King (1958), Agravaine is given a prominent role. It is Agravaine who is most affected by his mother Morgause’s coldness towards her sons. He kills a unicorn to please her, but she does not even recognize the gesture. Later when he finds her in bed with Lamorak, he (not Gaheris, as in Malory) kills her. Agravaine is the first knight to be slain by Lancelot when he is trapped in the queen’s chamber and thus it is his armor that Lancelot uses as he fights off the attackers.